Monday, October 16, 2017, 12:00 p.m. to 1:00 p.m. The past two decades have seen a rise in a focus on work/family scholarship for faculty in the academy. While research has documented the challenges that men and women face navigating their personal and professional lives, much scholarship tends to rely on the same theoretical frameworks: ideal worker norms and Joan Acker’s (1990) influential work on gendered organizations, which ultimately leads to the replication of findings. In this talk, I will review the ways in which theory has been used in past scholarship and suggest some possible avenues for expansion. I conclude by providing a brief overview of a study on the experiences of commuting couples (or academics who live apart for work-related reasons) that employs a theory of motivation as a theoretical guide. 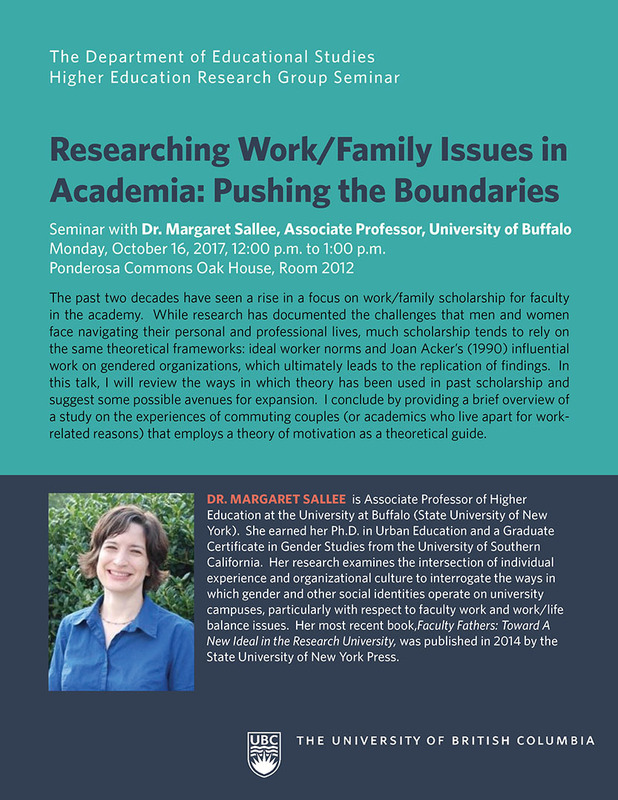 Dr. Margaret Sallee is Associate Professor of Higher Education at the University at Buffalo (State University of New York). She earned her Ph.D. in Urban Education and a Graduate Certificate in Gender Studies from the University of Southern California. Her research examines the intersection of individual experience and organizational culture to interrogate the ways in which gender and other social identities operate on university campuses, particularly with respect to faculty work and work/life balance issues. Her most recent book,Faculty Fathers: Toward A New Ideal in the Research University, was published in 2014 by the State University of New York Press.